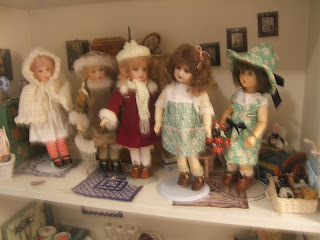 The pictures below are from a Round Robin I was in on the Bleuette Sewing Club in 2005. I think it ended December 2006. 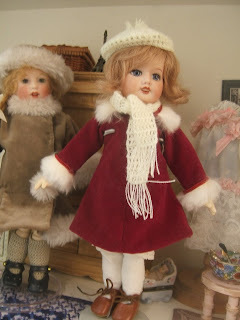 I do not have the names of the people who particpated and made up the outfits for my Bleuettes. I think I called my box, Winter Wonderful. 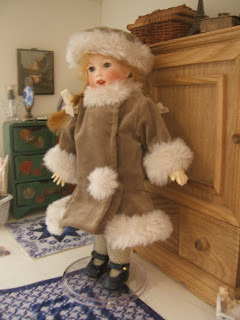 I did receive some beautiful coats, crocheted capes and hats and all. 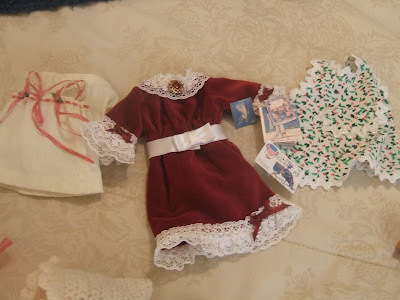 I also received some beautiful little dresses as you can see. Daisy is wearing a sweater that Ursula made her. This sweater is divine, such tiny little stitches. 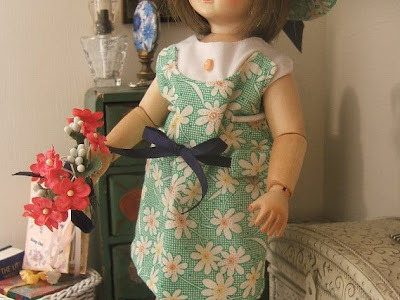 The picture below is Suzette wearing a dress from the Round Robin. 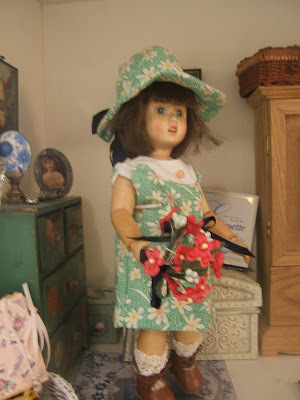 Suzette was made by Sue Wing. 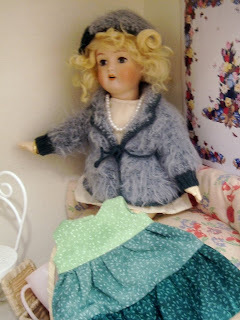 She is wearing a mohair wig. 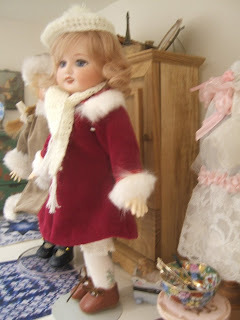 She is a sassy little doll and likes to frolic about! This is a picture of Suzette when she first came to me. 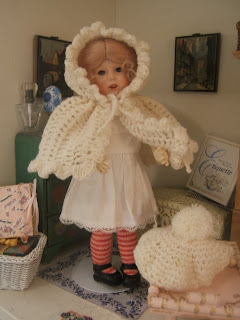 I liked the wig, but wanted a "more antique" look to her. 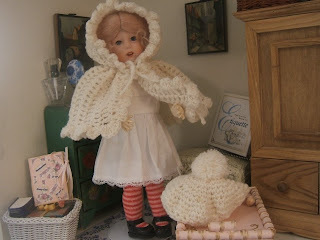 This last picture is of my "Bobbette" doll from Raikes. 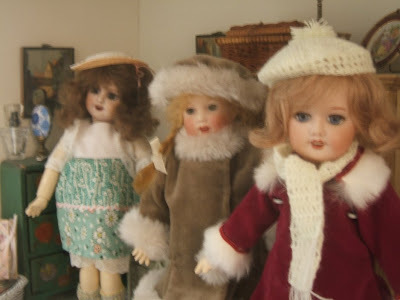 She is wooden, but made to look like the Bleuette dolls. 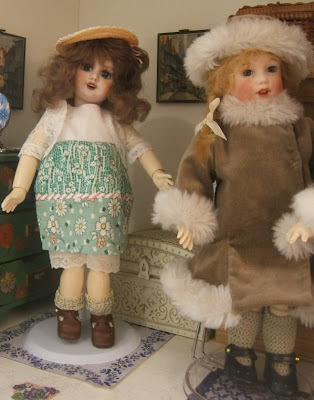 I really like her and she feels more substantial than my Bleuettes. 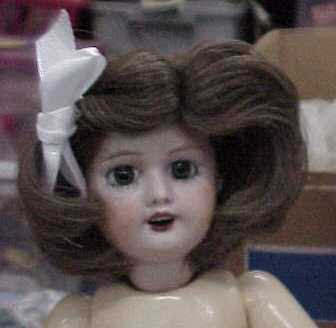 I just call her Bobbette. I have other wigs that I have tried on her, but this one seems to suit her. You can buy her with a painted face, or you can paint your own. 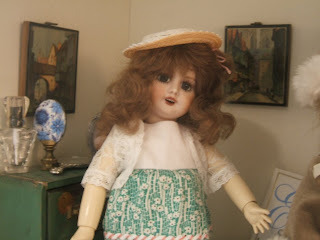 I bought Bobbette already painted.